My Weekend Girly Date With Jo | Oh Look, Krill! The cafe was crowded and we had to wait a about 15-20 minutes before we got a seat. The decor was slightly different from other CBTL outlets we’ve been to and the cafe served a wider and varied range of menu items. I especially like how much red meat is in their All-Day Breakfast section. Even the sides were interesting. It took us all of 5 minutes to decide what to have and so we had a mozzarella fritter to share. 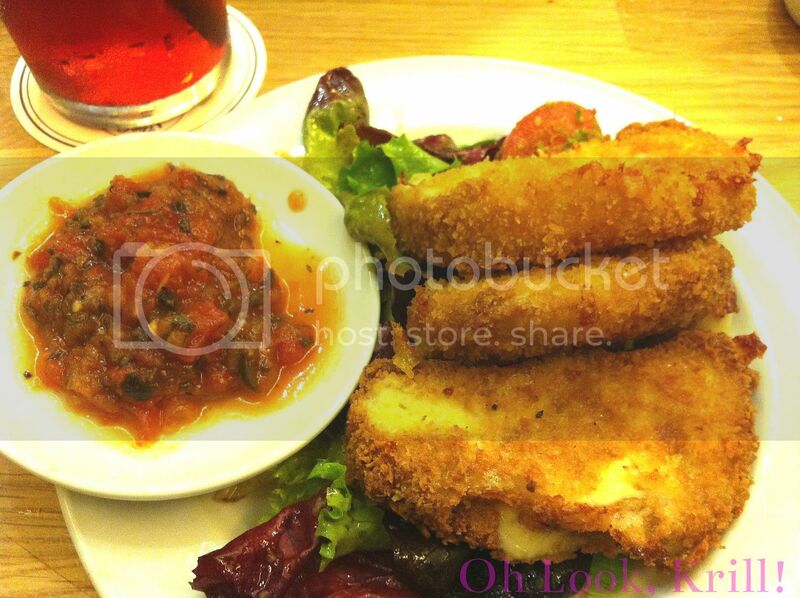 The crumbed cheese was served over a bed of tossed salad greens and some salsa. The cheese and the crumb covering were lightly flavoured, not salty like some of the other fried mozzarella that I’ve tasted. The tomato salsa was surprisingly spicy, just enough of a bite to make you sit up and take note of the flavour. The onions and the olives add a subtle depth to it. Jo, who doesn’t even like olives, loved the salsa too. The cheese was best eaten hot because once cold, the flavours just go bland and the texture just goes almost like Jumping Clay; soft, spongy and a little stringy. Three large slices of the mozzarella was a little two much for the two of us but if you’re with a group of people who love cheese, this is a must get. Jo got herself a breakfast platter, where she had scrambled eggs, a sausage, toasted bread and maybe some turkey bacon, I don’t remember too well. Too bad I didn’t take a picture. I, still with my red meat craving, ordered a breakfast steak and eggs. Finally, I’ve been shown that YES, YOU CAN HAVE STEAK FOR BREAKFAST! The steak was liberally salted and flavoured with herbs, served with 2 slices of thick, buttered toasts, a sunny side up and some onion bulbs pickled in, what I’m assuming, was raisin syrup of some kind. The steak was a little dry but surprisingly tender. The saltiness of the meat goes very well with the sweetness of the pickled onions and blandness of the toast. I wish that they’d actually given me a proper steak knife. As tender as the meat was, it still took quite some effort to cut it into bite sized pieces with the dinner knife they provided. 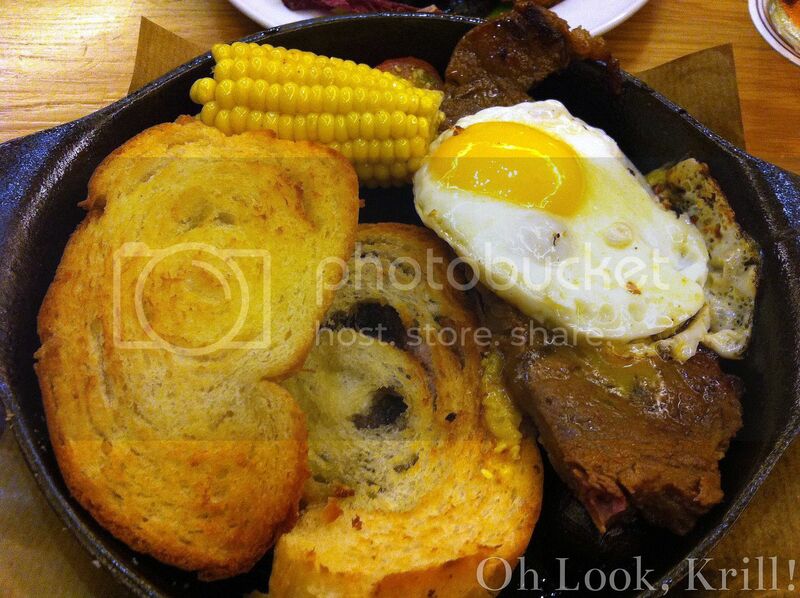 I think that one needs to eat the meat, the onions, the eggs and the toast in the same mouthful to prevent the meal from tasting a little too rich after a while, but it was a very satisfying meal. My red meat craving was satiated (for the moment) and it’s something I would recommend for anyone else who loves breakfast food at all times of the day, AND love red meat as much as I do. 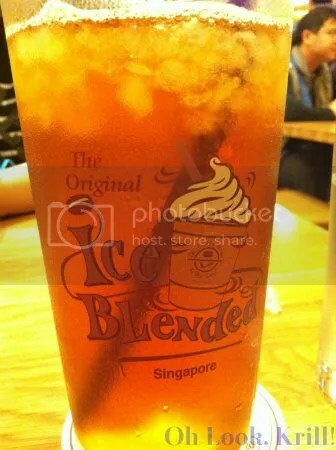 The total bill was a little pricy for CBTL but seeing that it was a very touristy place, I didn’t mind it too much. The ladies who served us said that it’s generally crowded during the weekends and during convention time but if you get a chance, do try the food there.